Studies show that eating plant-based food can reduce the risk of some types of chronic disease, including cancer and heart disease. For those who who don’t want to step foot in a 100% organic plant-based restaurant, you may want to think again. Vegan and vegetarian diets are higher in dietary fiber and vitamins and lower in calories and saturated fat. 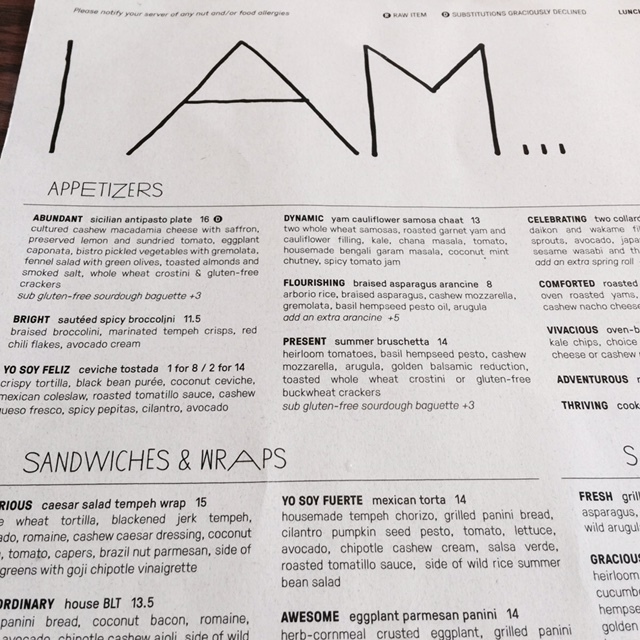 Cafe Gratitiude welcomes guests with a unique I AM … menu. “Each dish is named after affirmations to inspire you to love yourself, accept the world, and be full of gratitude,” said our server. Instead of asking for lasagna, you say, I’ll have “Fabulous” and your server repeats back to you “you are fabulous,” as she writes down the order. Servers also present guests with a Question of the Day, “What are you grateful for?” It’s a positive conversation starter for families and friends dining together and inspires people to put away the electronics and talk to one another. Since Café Gratitude is committed to supporting organic farms and biodynamic wine and beer makers, you feel good ordering off the menu and pairing it with a beer or glass of wine. 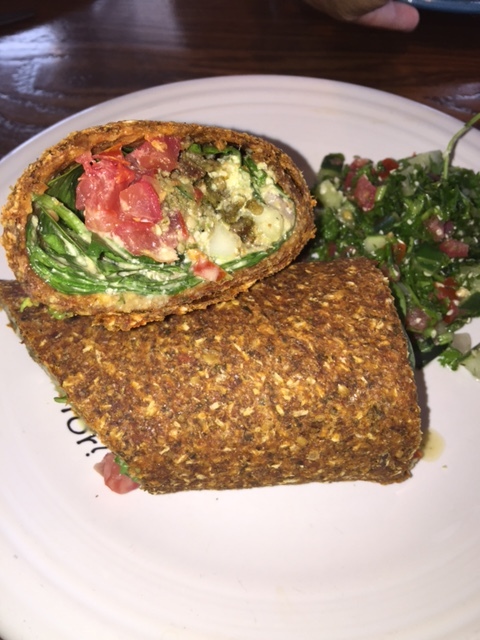 Due to my positive demeanor, I ordered the I AM…HAPPY, a Mediterranean raw wrap filled with goodness inside a whole wheat wrap. For those feeling magical or craving a burger, the I AM….MAGICAL double cheeseburger is made with two housemade black bean patties, grilled gluten-free amaranth and millet bun, shredded romaine, tomato, pickles, red onion, spicy cashew thousand island, chipotle ketchup, topped with cashew macadamia cheddar. Seeking a BLT type of sandwich? Order the I AM….EXTRAORDINARY sandwich made with coconut bacon, instead of the real animal bacon, and layered with lettuce, avocado and tomato. For those who like Italian cuisine, the I AM….AWESOME eggplant parmesan panini is made with a herb-cornmeal crusted eggplant topped with marinara sauce, cashew ricotta, tomatoes, brazil nut parmesan, arugula, and basil on a grilled gluten-free amaranth and millet bun. Amaranth is a grain packed with iron and calcium, and its fiber content is triple that of wheat. It’s served with a side of mixed greens with balsamic vinaigrette. Vegans and vegetarians sometimes like to eat a meal in a bowl. The MUCHO Mexican bowl is filled with black beans, guacamole, pico de gallo, and nopales cactus plant. It’s topped with salsa verde, cashew nacho cheese, spicy pepitas, romaine, and sprouted probiotic brown rice. Another bowl is the I AM….GRATEFUL community bowl. It’s layered with shredded kale, black beans, garlic tahini sauce, and a choice of sprouted probiotic brown rice or quinoa. We learned that for every bowl sold, Cafe Gratitude donates $1 to KISS THE GROUND, an organization that son, Ryland Engelhart co-founded. He made five minute movie, The Soil Story, to explain why our health, the health of the soil, and the healthy of our planet are one of the same. Finish with I AM LOVELY… – a baked gluten-free cobbler served with a scoop of housemade coconut cashew milk ice cream. 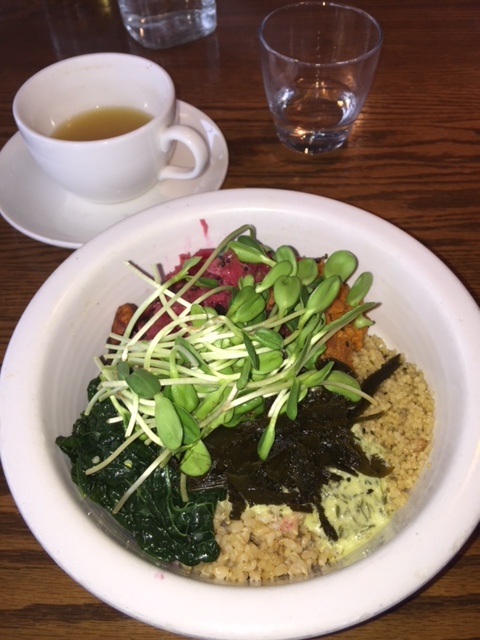 If you haven’t experienced vegan cuisine, Cafe Gratitude is one of the best spots to have your first plant-based meal. Not only is the food delicious, the positive staff makes sure you walk away feeling good about yourself. $$ Open 8 a.m. to 10 p.m. 639 N. Larchmont Blvd. (323)580-6383. There is also a downtown LA location 300 S. Santa Fe Avenue. (213) 929-5580. To find other locations, go to http://cafegratitude.com.